Were you one of the more than 300 people enjoying songs, crafts, and delicious snacks at the 2015 Family Holiday Festival at the Winters Community Center? The Winters Friends of the Library is an all volunteer support group that promotes literacy, fosters a love of reading, enhances the cultural life of the community, and encourages involvement in the library and its programs. Perhaps you heard your child sing and perform, or found a great bargain on a book, or got to snap a photo with Santa? Maybe you were moved by Mrs. Catalan’s class performing Our Town, a song written by that well-loved teacher. Did your kids get to make a craft? Wrap a gift? Enjoy the arts in a new way? Were you one of the families enjoying singing with professional musician and educator Katie Henry? Did your child have Katie visit their classroom and sing with them in the weeks before the event? We know that singing helps develop literacy skills, is good for the brain, and is good for health at all ages. Yet, oftentimes resources and time for music and performance get slashed from tight school, as well as arts, can get slashed or severely reduced by tight school budgets. Providing a venue for performing and funding enriching singing activities is one of the many unique ways the Winters Friends of the Library benefits our community. Yet, oftentimes resources and time for music and performance get slashed from tight school, as well as arts, can get slashed or severely reduced by tight school budgets. 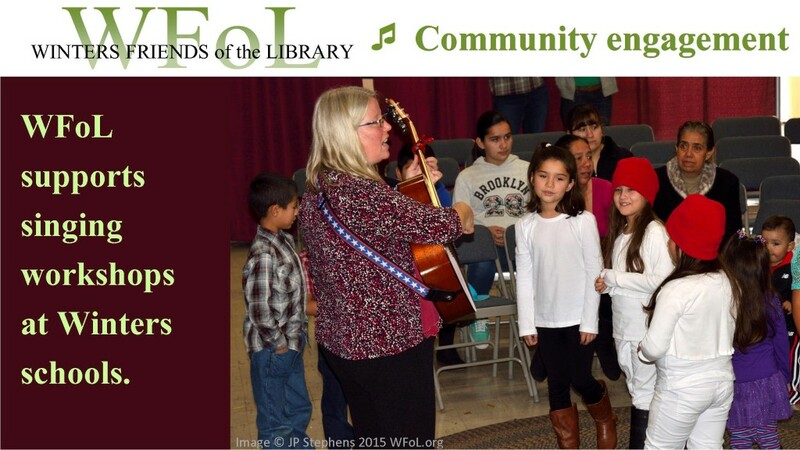 Providing a venue for performing and funding enriching singing activities is one of the many unique ways the Winters Friends of the Library benefits our community. Providing a venue for performing and funding enriching singing activities is one of the many unique ways the Winters Friends of the Library benefits our community. Many people who attended the event didn’t realize that the Friends of the Library organized this fun and free-to-the public event. Profits from the food sales and book sales are used to help fund the many programs we provide that support our library, literacy, and lifelong learning in our community. Profits from the food sales and book sales are used to help fund the many programs we provide that support our library, literacy, and lifelong learning in our community. You can help make sure that we can keep providing programs like this by becoming a member of the Friends. Joining the Winters Friends of the Library (or WFoL for short) is easy to do. Select your membership level and press the big green button to be taken to the payment page to enter your details. Joining the Winters Friends of the Library (or WFoL for short) is easy to do. Frist select your membership level, and then press the big green button to be taken to the payment page to enter your details. Read here about our new membership perks.